The Dolbany Eyewear collection recreates retro design in a modern setting. Each and every frame is handmade with premium materials and exceptional workmanship to create a perfect balance of quality and style. 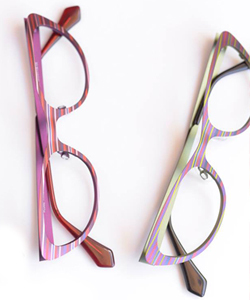 Comfort and fit are an integral part of each frame design. Dolbany eyewear comes in a variety of wearable colors and retro styles that are reminiscent of a past era of style and sophistication. Always maintaining the highest standards of design functionality and excellence, Dolbany offers a promise of quality that combines comfort, durability and fashion that is recognized even in the Hollywood fashion scene. The Dolbany Eyewear Collection stays at the forefront of eyewear fashion, offering a style, shape and color for any distinctive taste.